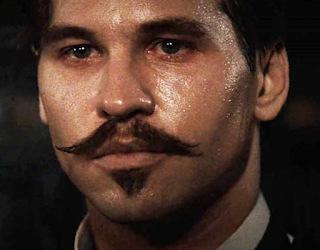 I was talking with some friends today who were remembering how great the movie "Tombstone" was, and especially the performance of Val Kilmer, as Doc Holiday, who was dying of TB (tuberculosis). If you haven't seen it, I personally highly recommend it. And although it was just a movie, the portrayal of someone dying of TB was fairly accurate. Tuberculosis is a particularly terrible and slow way to die, because it slowly makes it impossible for you to breath. It was, and still is, a very contagious disease, spread by people who might be in the same room with you, coughing (which went all all of the time), or touching you, or sharing a glass, or a bottle of whiskey with you. So make no mistake, catching TB at that time was a death sentence, and a lot of people traveled to where the air was dry, like Arizona, in hopes of being able to breathe, and live. In the movie "Tombstone" Val Kilmer really does give an accurate portrayal of how a man like him would have dealt with it. He would have been coughing, and sweating, all of the time. He would have been weak, and moved slowly. He would have known that he was not long for this world, and as a brave man, would have just continued on, saying snarky things like, "I'll be your Huckleberry" just to taunt the more healthy people around him. That he was good with a gun is true, but it's hard for me to imagine, it would be like having a nasty cold or flu that blurred your vision and dulled your senses. That was tuberculosis. And just in case you're wondering, yes, Tuberculosis is still with us. It's much rarer than it was in old-time Arizona, but it hasn't been eliminated. And while the treatments are more modern, it's still important to isolate people with TB to keep them from spreading the disease. So Val Kilmer's character could kill you two ways: quickly, with a gun, or he could cough on you. Image at the top of this post: Val Kilmer as Doc Holliday in the movie "Tombstone".